Many of you saw Adonis Garcia hit two homers already at the major league level, and probably wondered where in the heck this guy came from. Allow me to fill in the gaps. Adonis was born in Cuba, and played in Cuba until he defected in 2011. However, he wasn't allowed to join a major league team until 2012 when he entered the Yankees organization. He played there for the last three seasons until 2015 when the Yankees released him. 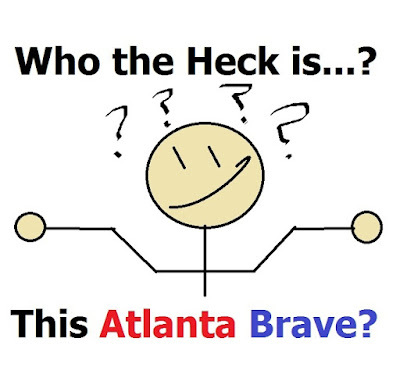 The Braves then signed him and sent him to AAA Gwinnett. Now, Garcia would probably still be playing in Gwinnett if it weren't for the Kelly Johnson and Juan Uribe trades, but the Braves needed someone to fill in at 3B and OF for the duration of the season. So, here comes Adonis. And he came in with a bang. In his 2nd and 3rd starts of the year, he hit home runs off Michael Wacha and Zach Britton. He harvested a couple of home run pelts from two impressive pitchers. But it's not all sunshine and roses for Adonis. He's only hitting .219 at the MLB level on the season, and he's really struggled against right-handed pitching so far. The good news for him is that in the minors, and so far in the majors, he's basically a replacement level player, which is really all the Braves are looking for on their way to this rebuild. Is that good news? Frankly at this point I can't even tell anymore. This weekend series with the Phillies had me questioning my faith in a lot of things. Garcia's upside is obviously his power. Those two homers were no accident, he can go opposite field with some serious pop. He also has good enough wheels to stretch out some doubles and even triples, while also swiping a few bags with his speed. The downside to Garcia is his plate discipline. He takes almost no walks and has at least one strikeout a game. He'll have to improve that if he wants to remain an every-day option at either third or left field. Combined with Hector Olivera, Adonis is another one of John Hart's moves that include older players from Cuba. I don't think that Adonis is anywhere near as talented as Olivera, but it sort of shows that Hart is committed to the idea of expanding his roster even more internationally. We now have 14 players on the 40-man roster who were born outside the USA, up from just 9 players last year. John Hart is casting a much wider net, and I'm hoping it will yield some decent results as he looks beyond just our own national shores. Is Garcia part of the future plans for the Braves past next season? I seriously doubt it unless he plays out of his mind for the rest of 2015. The Braves aren't going to compete long term if guys like Adonis are a long-term answer. But in a rebuild situation where you need competent, solid players to go out there in the field and possibly hit some long balls? Garcia is a good stop-gap solution.